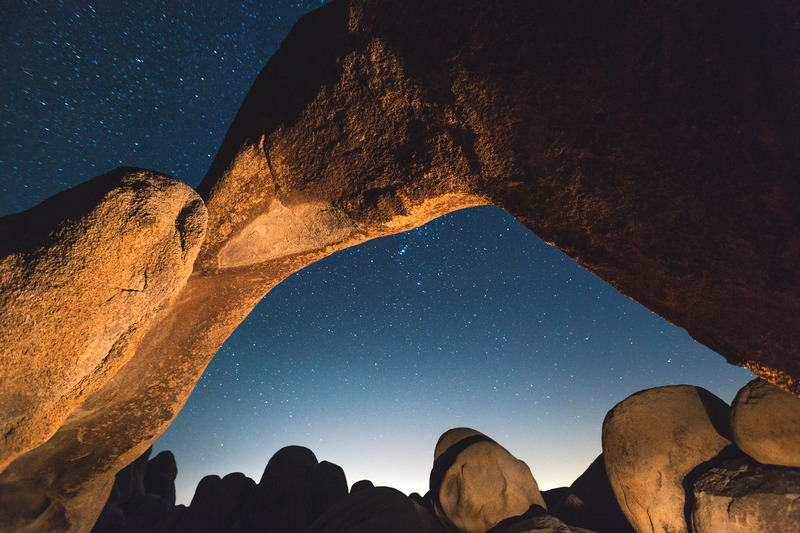 For more than 80 years, Joshua Tree National Park has preserved nearly 800,000 acres of otherworldly beauty as one of the world’s most incredible natural desert treasures. Sweeping, grand in scale and populated by granite monoliths and voluptuous rock and boulder formations, the park offers wonder to eco-travelers, outdoor adventurists, naturalists and adrenaline junkies alike. From sunrise to sunset, awe-inspiring skies of cotton candy pink, flaring salmon and gradients of blue from navy to robin’s egg flank all peripheral horizon lines, and nights arrive clear and sprinkled with infinite stars. As the park celebrates its 80th anniversary in 2016, why not discover its wonders for yourself? Two large ecosystems come together to form this quiet land, conducive to meditation and roaming, that have been carved by extremes in climate from wind to rain to an ever- present, relentless sun. In its vast starkness, subtle evidence of many diverse forms of life, linked by a hearty thrust toward survival, are found everywhere. Creosote, ocotillo and cholla cactus dot the geologic display between ever present and majestic Joshua (yucca) trees with their signature clusters of spiky leaves. The trees stand like sentinels across the topography, their presence inviting contemplation by amateur and professional photographers alike. During the day, life may seem scarce since the park is largely nocturnal – featuring reptiles and animals that adapt to the lack of water and high temperatures by going underground. This includes snakes, bighorn sheep, kangaroo rats, coyotes and black tailed jackrabbits. But the intrepid lizard, various spiders, frogs, armored millipedes, snakes, butterflies, an occasional desert scorpion and even a rumored tortoise may still be found braving the searing trails or tucking into the cooler crannies of rock. 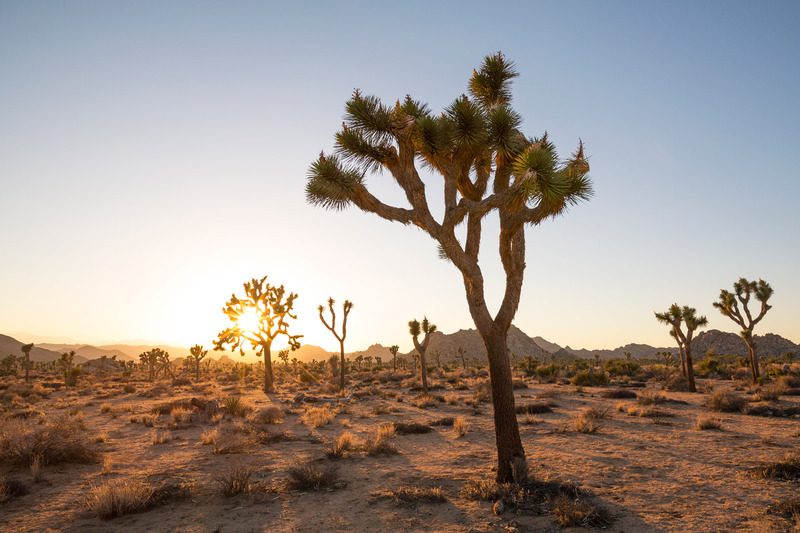 Although within a general sweeping glance it may appear the plant life is sparse, Joshua Tree is, in fact, known for nearly 750 diverse species. This includes bryophytes, herbs, trees and shrubs and a constant smattering of vivid lichens and moss painting their swaths across facades of stone. One of the best ways to experience the park is to enjoy a day hike. One of the most popular is the 2.2 mile Old Mill Hike that boasts remains of one of the many mines that settlers looking to get rich populated long ago. It features the bones of a windmill, junker cars and other equipment used to crush gold ore. It is relatively flat but offers little shade and can be accessed from the same parking lot as the Barker Dam Trail. Another good destination is Keys View, perched on the crest of Little San Bernardino. It offers panoramic views of the Coachella Valley in the low desert where the Greater Palm Springs area lies. Skull Rock, shaped as such, is a favorite stop for visitors as well with its eroded rock that reveals the appearance of two hollowed out eye sockets. Crack, slab and steep face rock climbers will also find a paradise in the more than 400 climbing formations and multiple climbing routes for every ability level. Aside from the recreational offerings of the park, nine different campgrounds promote the blissful experience of sleeping beneath the exquisite Southern California nighttime skies. Whether crawling from a tent at sunrise or taking a dusk- time break to sprawl on a flat plateau, visitors to the park are assured an experience that parallels that of the thriving human spirit in all its glory. Before or after visiting the park, it is also worthwhile to check out some of the local color of the surrounding towns. The high desert is a treasure hunter’s dream with its wide assortment of thrift shops and antique stores. After a hearty day of recreation amongst the natural wonder, tourists can quench their hunger with Mesquite wood barbecued meat and a pint of beer at Pappy & Harriets, a watering hole inhabited equally by Los Angeles hipsters and indigenous cowboys, bikers and eccentrics. Live music livens a bill ranging from indie and folk to honky tonk and rock and roll to classic punk rock. Or amble on out to the eccentric The Palms Restaurant on the verge of Twentynine Palms and Wonder Valley where drinks are dirt cheap, and the two siblings who run the place are known to entertain with impromptu band shows or artsy films. Before heading home, don’t forget to pick up a slice of pizza at Pie For The People, where toppings are brainstormed daily and have included such odd combinations as strawberry and gorgonzola. Those looking for the spiritual can enjoy a sound bath at The Integratron, a historical structure that is described as a resonant tabernacle and energy machine sited on a geomagnetic vortex. It has been called a “naptime for grown ups.” The artistically inclined might opt for a trip to the Art Queen, where artist Shari Elf lives in a chic Airstream trailer and sells her wares alongside the curious World’s Largest Crochet Museum. World-renowned artist Andrea Zittel’s High Desert Test Sites is a noted non-profit organization that supports intimate and immersive experiences and exchanges between artists, critical thinkers, and general audiences. Its installations are placed out in the middle of the desert and are fun to visit by car or on foot. Another beloved spot is the Noah Purifoy Outdoor Museum where the artist lived for the last fifteen years of his life creating junk sculptures all over the property surrounding his home. Or drive over to Pioneertown, which started as a live-in Old West motion picture set in the 1940s. Many of its structures still stand for photo opportunities and exploration. Orchid nuts can visit the Gubler Orchid Farm for a few specimens as souvenirs. All photos courtesy of Lance Gerber; www.nuvueinteractive.com.